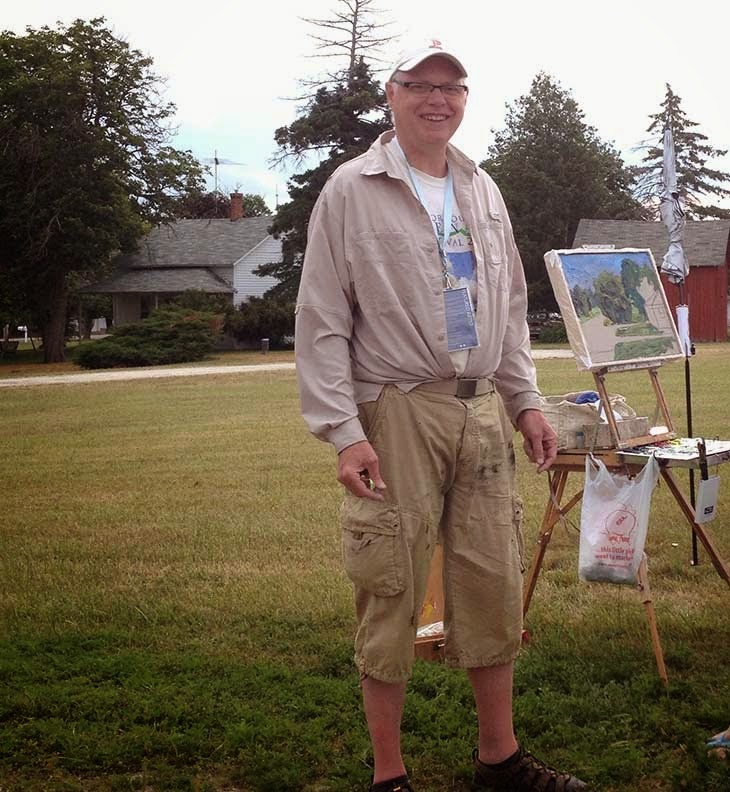 I JUST got back from the Door County Plein Air Festival. It was a great experience. The painters in attendance were amazing and the resulting show was by far the best plein air show I've seen. The event was extraordinarily well planned by the staff of The Peninsula School of Art and it was a pleasure to meet fellow artists. My personal performance was good although the overwhelming greens of Door County threw my desert dwelling sensibilities a curve. But after the first painting–which took a record five hours to paint–I successfully adjusted my palette. By Friday evening everyone had four paintings in the gallery. I felt my work was competent and adequately exhibited my thick style–with perhaps less broken color which I attribute to excessive focus on getting the greens right. I didn't sell as many paintings as I did in 2010 which was surprising. But such challenges gives us opportunity to review our motivations and methods. I'm not advocating taking counsel from our fears or giving up but setbacks can induce the type of introspection that incites meaningful change. I embrace the feedback from Door County only to the degree that it confirms my own intuition. Two ways lie before me–retreat to a thinner style with more accurate representation or distance my style even further from conventional plein air technique. Stay true to you is all you can do. Absolutely! This experience reset my commitment to following my own agenda and not chasing what sells. Thanks for your comment! Hi Brad, keep the faith for sure, I think your style is awesome. What changes did you make to your palette? The basic change was to remove Thalo Green. I can use it out west but at Door County I saw that high chroma green and I added it via Thalo and it was a disaster. As if I had never used Thalo before. Weird! I feel that failures are perceptions. If we felt satisfied in what we did, the result doesn't matter, success is that satisfaction. An essential part of creativity is being truthful to what we believe in, hope to see more and more of your works that spell individuality and incredible style. Thanks for the encouraging words, Padmaja! I appreciate it. 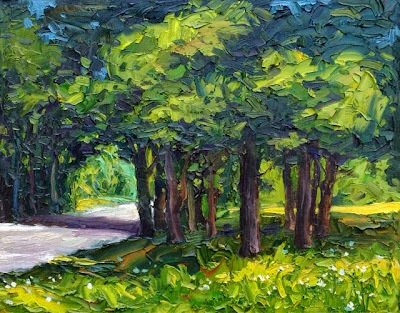 i'm 100% sure you will correct your plein air. chasing green in sunlight is the hardest test. Thanks for the kinds words, Bruce. I do need to shake up my plein air approach. It will be fun to see what emerges. Greens is a historic problem for painters. Just have to learn how to approach it in a manner that can address it creatively. Another famous plein air painter told me once that much of the plein air circuit is filled with homogenous paintings. He tries to separate himself from the run of the mill. Of course we would all expect you to follow your own voice and path. Nice painting, BTW. It's a good design and composition. The texture adds vitality and energy, the strokes cause eye movement and flow. Very good, Brad. Don't stop. Keep following this voice and approach. It is tempting to change to a style that can adapt to the various aspects of such competitions (thinner paint allows for more and faster change) but I think the real path forward is to develop a distinctive style–in my case thick paint. In time I will adapt to the pressures of competition and will have something really amazing. That would be cool! If the above image is the example of the green failure that you are speaking about, I'm not so quick to agree with that. To me it looks like you didn't have time to make one or two more passes through the painting to fix the acid green light that dominates the painting, whether it would've been to kill the pthalo intensity or to enrich it. The blue shadows also look like you had to quit before you could change their unvaried blue look. Normally you add opposites tints and shades to the main light and dark areas. Plein air causes one to make fast hard general decisions, or perhaps I should speak for myself by saying that five straight hours of very engaged looking and painting is a whirlwind experience for me and it's not enough time for me to see glaring mistakes much less fix them. As to thick vs. thin, I guess we just have to feel which way is needed depending on the individual painting. I'm beginning to think that each painting that I do represents a different state of mind, so doing a series of like-pictures or exploring a technique more deeply is no longer part of the deal. This is way different than what I have been leading myself to believe. I think my mind was so focused on doing well and making sales that my essential process–using broken color to achieve the semblance of nature–flew out the window. My desire to do well subverted the artistic process. I attribute some of that to the incredible competition that presented itself at the event. For me– not being a very competitive person–it proved too much of a distraction. For me to succeed at these events I need to learn to completely dismiss any perceived competition. There were some major prizes at stake too and I'm ashamed to admit it affected my thinking. I get it Brad. The desire to do well, and especially the part about the prize money is very understandable. Painting is an expensive habit and sometimes it gets hard to justify buying paints and all the other stuff that goes along with the 'passion.' I will soon be facing the same plein air competition scenario in my neck of the woods as you did at Door County, and just thinking about the looming event affects the way I paint and I haven't even painted anything for it yet. I've already begun to plan one or two pictures, and that does not bode well because it goes against my nature to prepare intensely. I'm doing it for two reasons: first, because there is prize money, and also because not doing it would feel like I'm closing an open window. There are precious few windows of opportunity for showing and selling art in my rural community, so when one opens up it behooves me to go through it. Well, as the old saying goes: " I could always stay home and choke on a piece of bread." Sounds like a similar situation. My only advise is to achieve a zen-like attitude and just paint without any consideration of prizes or acclaim. It can be hard to do especially if there are events where the public is invited. That adds a different layer of stress. At Door County we had a public event on Wednesday evening and I really enjoyed it. I think that is one reason that I was so perplexed with the outcome was that in some ways I was doing better than I usual. Thanks for the wise advice. I don't know about the Zen achievement , but ignoring the possible rewards can be done. I guess, what bothers me most about a competitive event with judges, is the knowledge ( based on experience ) that what I paint is not what they want to see. I'm pretty sure that picturesque scenes will win the day and I shy away from the postcard look. It's easier to succeed with a typical composition that follows the time-worn rules of landscape painting and more difficult to capture the life in a motif. I will probably choose the raw approach and accept the consequences. you know what feels right, go with it. i think after reading your replies you had an old fashioned choke. paint it and they will come......and write checks. try filming your canvass with narration as you paint to avoid the eye on the prize distraction. isn't hindsight wonderful? You are right. I purposely didn't film so I could focus. I don't have a single frame of the event. But perhaps filming would have allowed me to focus on something external. I have to say though that Wednesday night when I painted outdoors with patrons milling about (which is often difficult for me) was magical.The painting just magically appeared. I was at a plein air event recently in these lush GREEN mountains (Vermont) and I was watching a very good painter painting what was a dominantly green landscape. He was using a lot of colors and not trying to match the greens at all. The result was great and I talked to him after. He advised me to look at the color temperature. Representing the changing temperature was what he was focus on, not the hue. It really worked for him and I walked away with something new to consider. Good advise! have successfully painted trees and grass by laying down a layer of reds and orange paint first. I think the pressure of so many great painters shut down a part of my thinking process. Not good but understandable. I have to admit I don't focus on temperature as much as I should. I recently came across a temperature analysis that used the Kelvin scale as a temperature analogy. There is no green on the Kelvin scale which is weird when you think about it. Something to think about.